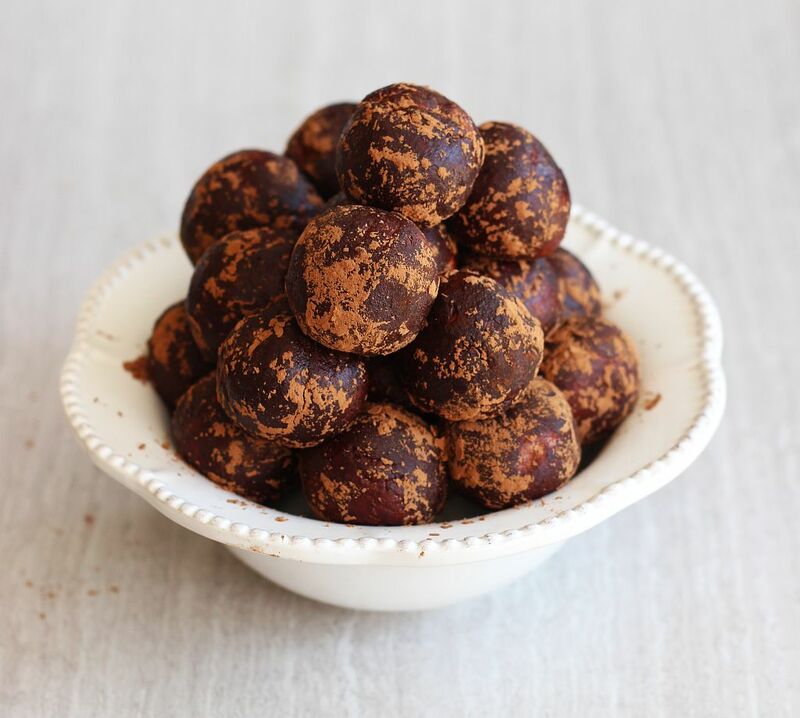 A recipe for a super easy, one-bowl, no bake chocolate peanut butter protein ball with lots of good-for-you ingredients! Since I just recently brought you the ultimate in peanut butter decadence, today I thought we’d visit the opposite end of the spectrum with something legitimately and truly healthy, but still with lots of peanut butter. Thank goodness. Also, I’m not just claiming they’re healthy, but then they’re really not and it’s still dessert masquerading as ‘healthy’… these are actually, honestly good for you. There’s many permutations of protein balls, but I love these in particular. 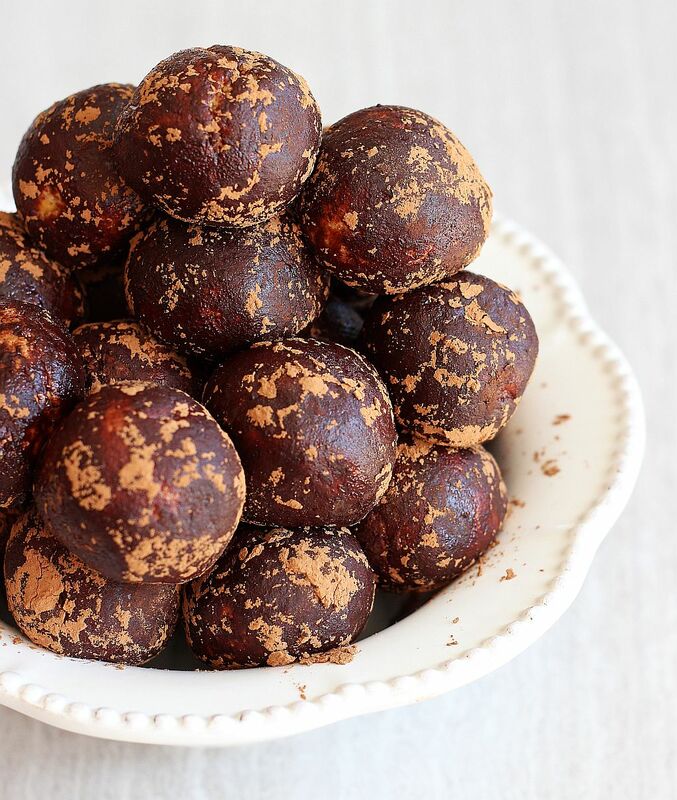 After all, there’s a boatload and a half of other no-bake protein ball recipes out there. 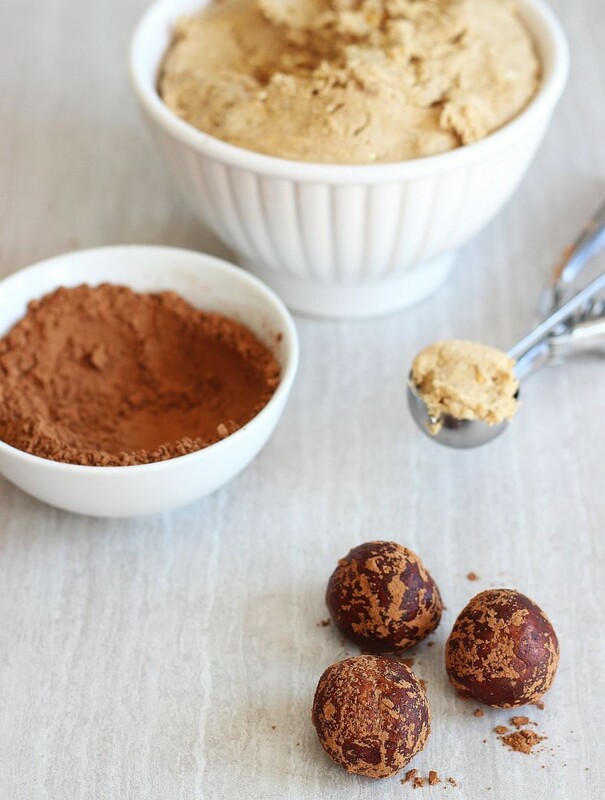 You’ve certainly got your pick, but these are not your garden variety Chocolate Peanut Butter Protein Balls! Little tweaks make these really special. 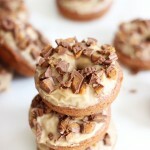 The main ingredient here is peanut butter, so you already understand why I’m a fan. Honey plays a pretty significant role too, and those two together make a great team. Throw in cinnamon and a few protein boosters, and you’ll have a healthy and filling snack! There’s also one unexpected ingredient in these: coconut extract. You might be tempted to dismiss it as unnecessary. I know I initially discounted it and didn’t appreciate its importance. But you need it. It has a really surprising and great impact! Do not leave it out! I mean, you can leave it out if you’re in a pinch, but don’t be in a pinch. It really adds so much to these little nuggets. I don’t know what it is – something about the cinnamon and coconut with the peanut butter. They are so easy to mix up, and there’s no baking required. They’re one of my favorite snacks when I just need a quick, satisfying bite. The ingredients are all good-for-you, so you can enjoy these guilt-free, but still feel like you’re getting away with something. These are a staple in my household, and we always have a batch stashed in the freezer to grab from as needed! 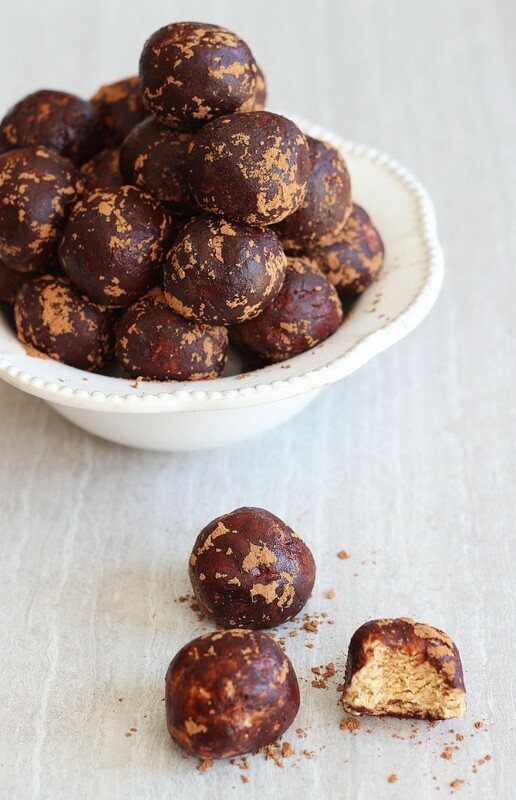 An easy, no bake, chocolate peanut butter protein ball, made with vanilla protein powder for an extra protein boost! In a large bowl, combine peanut butter, honey, coconut extract, and vanilla. Mix well. Add in vanilla protein powder, non-fat powdered milk, and cinnamon. Mix until well-blended. 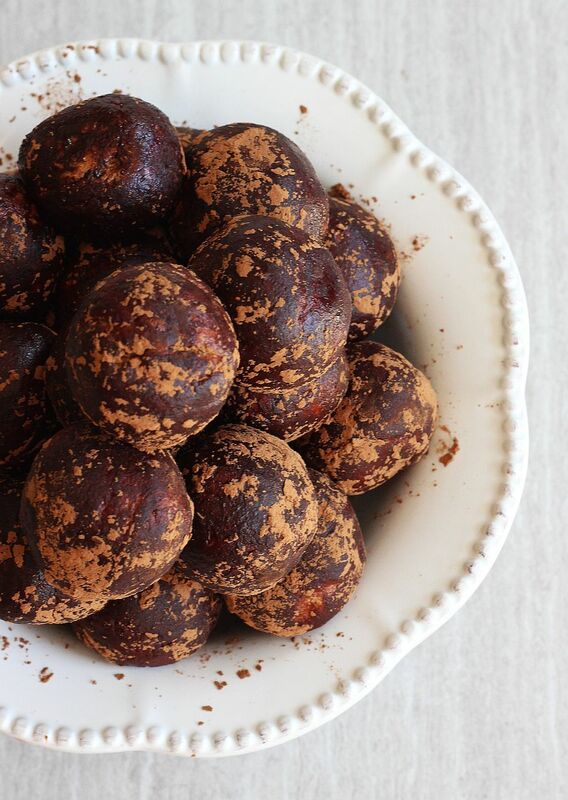 Roll into 1-inch balls, and roll in cocoa powder. Adapted from Oxygen Magazine’s Chocolate Energy Truffles. Happy Saturday, friends! Have a great weekend! Yeah, the coconut extract really does something for these! Definitely get some and include it. It totally adds! They’re a favorite – we keep a batch on hand at all times! I love making energy bites like this, Sarah! 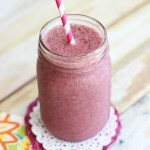 It’s so fun to create new flavor combinations and try to keep it on the healthy side. These chocolate peanut butter balls look gorgeous! I love the addition of protein powder and powdered milk. I’ve never tried those ingredients before, so sounds wonderful in these cuties! And these are so perfect for stashing in the freezer, too. Pinned! Have a great weekend, friend! There’s a MILLION different chocolate peanut butter protein variations, but these are our favorite! Of the ones I’ve tried anyway. We love ’em! 🙂 Found the recipe in Oxygen magazine and have clung to it ever since! I could use a bag of these in my snack drawer!! I love these Sarah! I think I need to have these in my refrigerator all the time…I am craving for something like this after I’m back from the gym. thanks for the recipe, will give it a try! Pinned. I actually double this recipe and make a ton of them and sock them away in the freezer so that we have a lot on hand. These are really good! Something about the coconut extract really makes these better than just a traditional chocolate-pb combo too. They’re a favorite, for sure. I always keep them refrigerated because they get messy at room temp, but in fridge and freezer they hold up forever! 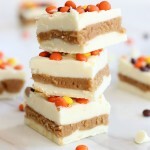 So in terms of taste and nutritional quotient, how do these compare to your Chocolate Peanut Butter Graham Protein Bars? ie, which tastes better, and which is “healthier”? Also, how do they both hold up if you take them on a roadtrip or hike where they can’t be kept refrigerated? Thanks. Good question. The Graham ones are still much more like a dessert that happens to have a nice protein boost in them, however, they’re good for packing for a hike and on-the-go. These are definitely the healthier of the two, and they are good for on-the-go, but they hold up much better if they can stay cold in a cooler. I take them with me in snacks, but always in a cooler with my other food. At home, I keep them in the fridge or freezer. I actually like the taste of these a little better too even though they’re truly the healthier option. Make sense? I need these! The only problem is that I probably wouldn’t be able to stop eating them. 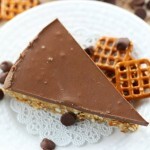 Peanut butter and chocolate is the best combination! These look SO good! 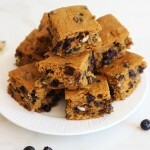 I love classic recipes that have been made with healthier ingredients. Thanks so much for sharing. Thanks so much, Heather! They seem like just another chocolate peanut butter protein recipe, but the coconut extract and cinnamon make all the difference, believe it or not! 🙂 Have a great week! i’m all about the healthy snacks! Thanks, Kyla! Yeah, these are an Oxygen Magazine recipe. Have you tried them? 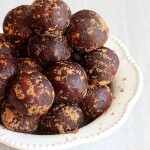 They’re my favorite protein ball recipe so far! I *totally* forgot – thank you for reminding me. I’ll definitely see you there tomorrow! Thanks for the invite. 🙂 Happy Friday! Sarah these look amazing and a perfect pick me up snack!! Definitely! I’ll see you at the party! Thanks so much for hosting! These look yummy! Will have to give them a try. Let me know if you do! We love them! 🙂 Thanks so much, Francesca! Thanks so much for the party every week!! Happy Thanksgiving to you and yours!